As the Northern hemisphere approaches winter and the vaccines are in the process of being given before the annual flu season begins in earnest, the country starts to focus on these mysterious viruses that continue to infect us year on year. But if you look closely at influenza viruses, you’ll realise that there’s an awful lot we don’t know about them – especially how they spread from one person to person or even from one cell to another cell. For one, why do they make these impressive strands or filaments emerge from an infected cell? The 15th of October is Global Hand-washing Day, and this year’s theme was “Make Hand-washing a Habit!”, which continues to be an important way to stop some infections but did you ever wonder if it would stop the flu? To answer this question, for our podcast, we spoke to the CVR’s Ed Hutchinson – an MRC career development fellow – and Swetha Vijayakrishnan who is postdoc in the Bhella group, who share an interest in the shape of the virus particles produced by influenza and its role in virus infection and spread. Ed and Swetha talk about the work they’re doing currently at the CVR on using molecular techniques alongside new electron microscopy methods to understand how flu spreads and especially focusing on these filamentous forms of the virus. As the two explain in the podcast, washing your hands probably won’t help against influenza viruses because it can be transmitted through the air without the need of a ‘helping hand’. Influenza virus filaments (boxed in purple) emerging from an infected cell from Vijayakrishnan et a., 2013. Ed and Swetha collaborated with other scientists at the CVR and the University of Oxford on a paper earlier this year that reviewed the research that has been done to date into the filamentous virus particles) produced by influenza viruses, and other related viruses. 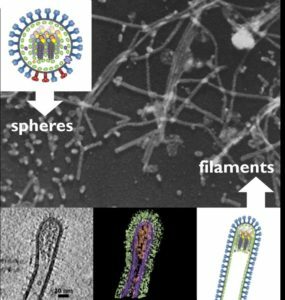 The typical spherical and bacilliform (or “baked bean-shaped”) virions produced by Influenza viruses have been well documented for a long time, and the filamentous virions are no different, their appearance having first been recognised as far back as the 1940s. Despite this, there is a lot that remains to be discovered about their composition and function. 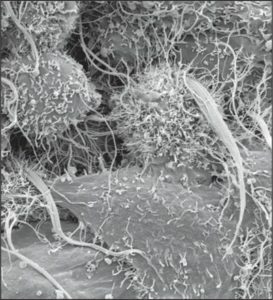 The filaments are very fragile, and the heavy reliance on electron microscopy as an imaging technique has limited the ability of scientists to visualise them, as many of the processes involved in preparing the virus particles can shrink and damage their delicate structure. In 2013, Swetha published a paper describing the results of imaging clinical isolates of Influenza A at high-resolution. In the podcast, she discusses how the development of cryo-technology in electron microscopy has made imaging these virions much more successful, overcoming the problems associated with the previous methods. Freezing the samples at liquid nitrogen temperatures instead of chemically fixing them allows us to see them in a much more natural state, allowing us to envisage what they might look like in an infection, and building on existing research to that effect, for example in early microscopy investigations or even in autopsy cases recently. other viruses, including respiratory syncytial virus (RSV) and the filoviruses, Ebolavirus and Marburgvirus. Bourbon virus is another orthomyxovirus similar to influenza, which is transmitted by ticks and also forms some very unusual filaments. Many observational studies show that filament formation is an advantage for influenza viruses in natural infections , and although there are many possible hypotheses surrounding this (by helping the virus escape mucous? directly spreading infection from cell to another cell?) it remains to be seen exactly what these advantages are. In the podcast, Ed and Swetha discuss what research at the CVR is being done at the moment, or planned for the future, to develop our understanding of the role of these filaments during virus infection. If you listened to this episode of Contagious Thinking, and have a couple of minutes to spare, please fill in this questionnaire about the podcast. As part of my Undergraduate Honours project in Microbiology, I’m working at the CVR to create digital public engagement materials, including this podcast, and would appreciate your feedback to improve the quality of the next couple of episodes. Thanks– Josie Bellhouse (University of Glasgow Microbiology intercalated student).